Dr. McElwee-White received a B.S. degree from the University of Kansas and completed her Ph.D. at the California Institute of Technology. After two years of postdoctoral work at Stanford University, she joined the Stanford faculty as an Assistant Professor in 1985. She moved to the University of Florida as an Associate Professor in 1993 and was promoted to Professor in 1997. 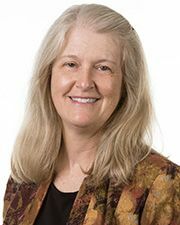 Following a term as Associate Dean for Administrative Affairs in the College of Liberal Arts and Sciences, she returned to full time research and teaching. She currently serves as the Director of the NSF-CCI Center for Nanostructured Electronic Materials. Prof. McElwee-White’s research interests center around the applications of organometallic chemistry in catalysis and materials science, including precursors for chemical vapor deposition of inorganic materials, catalysis of oxidative carbonylation reactions and electrocatalysts for use in direct alcohol fuel cells. These projects have been funded by a variety of federal agencies and private foundations, including NSF, DOE, ARO, ONR, NASA, ACS-PRF, the Beckman Foundation, and HHMI. She is the author of 112 refereed publications and has presented 133 invited lectures. Her Editorial Board service includes Organometallics, the Journal of Organic Chemistry, Letters in Organic Chemistry and Current Organic Chemistry. She has recently served as Chair of the Division of Organic Chemistry of the American Chemical Society and was named as a Fellow of the American Chemical Society in 2010. Dr. McElwee-White’s research interests include applications of organometallic chemistry to problems in materials deposition and catalysis. Recent areas of research include organometallic precursors for the chemical vapor deposition of inorganic films that are of interest for manufacture of semiconductor devices and OLEDs, precursors for deposition of nanostructures, and heterobimetallic catalysts for the electrochemical oxidation of alcohols with applications to fuel cells.